As we head into the holiday season, we couldn’t help but think of all of the cookies people across America will be baking this month. And then we remembered this delicious recipe for white chocolate chip and walnut pot cookies. These yummy morsels are a tasty way for medical marijuana patients to alleviate symptoms from ailments such as cancer, HIV/AIDS, chronic pain, and more. Plus they are easy to make, so you’ll be medicating in no time. 2. In a large bowl, mix together the canabutter, brown sugar, white sugar, and egg. 3. In a separate bowl, mix together the flour, salt and baking soda. 4. Slowly combine the flour mixture to the butter mixture, stirring until smooth. 5. Stir in the chocolate chips and walnuts. 6. Roll dough into 1-inch balls and place them 2 inches apart on a greased cookie sheet. 7. Bake for 10-12 minutes or until slightly browned on the bottom. 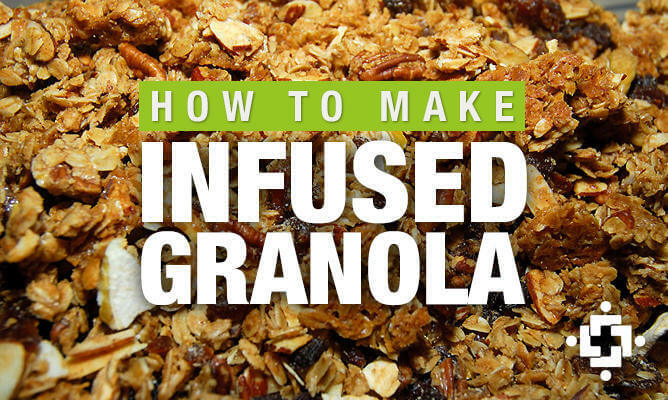 Cooking with Cannabis: "Cannabis Granola"